This is the circuit diagram of a low cost metal detector using a single transistor circuit and an old pocket radio. This is nothing but a Colpitts oscillator working in the medium band frequency and a radio tuned to the same frequency. First, the radio and the circuit are placed close. Then the radio is tuned so that there is no sound from the radio. In this condition, the radio and the circuit will be in the same frequency and the same frequencies beat off to produce no sound. This is the set up. When the metal detector circuit is placed near to a metal object the inductance of its coil changes, and so do the frequency of oscillations. Now the two frequency will be different, there will be no cancelling and the radio produces a hissing sound. This means a metalÂ object is detected. To make L1 make 60 turns of 36SWG enamelled Copper wire on a 1 cm PVC tube. Powering the circuit using a adapter rather than a battery induces noise. It is always good to power radio projects from a battery. To detect metal objects in conveyor belts. In food processing industries it is important that no metals are accidentally included so having a metal detector near the conveyorÂ belts which carry the items for packing will do the job. do we search in FM or AM frequency and what is the range in which we should tune in. How can i make 22nH inductor coil. What size of copper can i use and how many turns will it be. sir pls how far in meters can this metal detectot detect? There is no C2. it can be added as 100uF 16 volts across supply as a decoupling compound. Can you tell me at what frequency the radio will go silent as I’m finding difficulty in tuning the radio to the inductor.Also can you tell the distance at which the metal would be detected by the circuit? Does MW radio mean Medium Wave radio? Can you tell me at what frequency the inductor will be in resonance with the radio?Also can you tell me at what distance the metal should be placed for the circuit to detect?? Sir i accidently bought 30 swg wire can it be used for the inductor?if so what length of it should i use .Also sir how do we detect the output from this circuit ?? Hi yes you can use. The same description applies for 30SWG also. The output is detected by the change from quite to hiss in a MW pocket radio. The description gives the operating principle. hello! I can’t find a BC 548 transistor. Can i replace it with NPN 2N3904? please REPLY. I’t’s very URGENT. Hi Revathy use a MW pocket receiver close to this circuit use an ear phone to listen. now switch on both and tune the pocket radio till you get a silent zone that is empty carrier without any modulation (information). normally without any station tuned in you will get the frying noise with a blank carrier it will become quite. 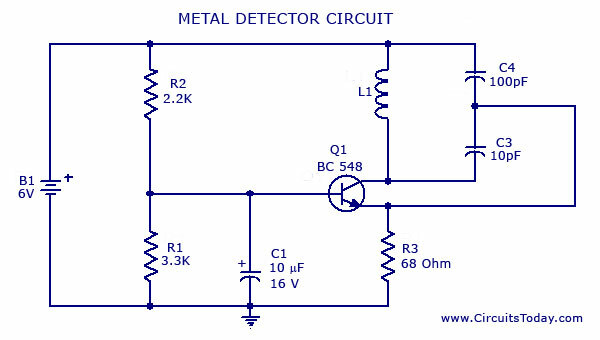 When ever a metal is approached by the detector the oscillator frequency will shift hence the silence will change to frying noise indicating the proximity of metal. Hi thompson it should be between few inches to few feet (5feet or so) it depends on the skill of the operator. How can we know that the metal detector range?That is up to how much distance it can work. what do u mean by 1cm in L1,is it radius or diameter or length??? up to what frequency the radio should be tuned?? I COULD NOT UNDERSTAND THE SPECIFICATION OF COIL ,IS 1CM LENGTH OR DIAMETER OR RADIUS OF PVC TUBE??? PLS REPLY ME ,ITS URGENT AND ALSO AT WHAT FREQUENCY THE RADIO SHOULD BE TUNED??? Has anybody tried this circuit? Tune medium wave pocket radio till you get the frying noise stops and you get the radio silenced. what band have i to tune the pocket radio to. Hi Aitya you please refer to comment dated 15 Aug on the use of radio. you have to use 10PF only for the circuit to function properly. Hey i am unable to find 10pF capacitor.Can i use 100pf instead of it.And is using a fm mobile phone sufficient or a pocket radio is sufficient.Can u tell the approximate frequency. Hi Shinoj 38SWG is 38 standard wire gauge is the size of the cable. 38 swg is 0.152mm or 0,006inch diameter wire. equivalent to 34AWG. you have to use this dia super enamelled copper wire for winding the coil. I was wondering if any other part of the circuit has a change besides for the oscillation frequency (ie: a change of voltage drop over the resistor or capacitor)- surely something else that is actually measurable must also change? This will sense the proximity of metals, which will change the frequency of the running oscillator. TO TAKE DETAILS, METAL DETECTORS(KITS OR PCB). Thank u very much to the attention for me. I visit your web site & I found some details about your Circuits. I need to build a metal detector which can find metal (Gold coins) at a depth of 0.5m (0.2m< depth <0.5m) in rock (stone). Itâ€™s good, if the m/c detects only GOLD & Simple indicating system is enough(LED bulbs or uv meter). Please give me the full details soon. i wanna ask how i can make the coil l1 it is really very hard to find a wire with 0.19 mm thickness plz help?? and then to make 60 turns with 1 cm diameter? is it possible that the frequency of radio and the oscillator to be tuned at same so easily?or we have to calculate the frequency of the oscillator? Comment: good circuit but need more clarifications for beginners like me. where should be placed radio, i.e how far ? can u make a detector to operate a relay ? Author:The radio should be placed at least with in 1 meter from the circuit.It is always better to keep radio as close as possible. It is a bit difficult to make this circuit to operate a relay.I am working on it.